Apodoulou is situated some twenty kilometres northwest of Phaistos on a site beneath Psiloritis overlooking the Libyan Sea. 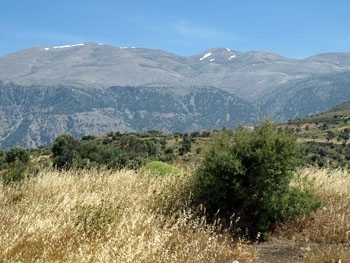 It is located on one of the main routes from Phaistos to the north coast -- a route which also passes the Middle Minoan palatial administrative centre of Monastiraki at the south end of the Amari valley. The area was inhabited from Late Neolithic times up to the end of the Minoan era but it is important for the protopalatial settlement which covers an area of at least 3,500 square metres. 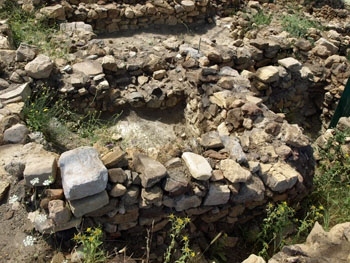 The settlement was destroyed by fire at the end of the protopalatial period but the area remained occupied into the neopalatial period, unlike Monastiraki a few kilometres further north, which was totally abandoned after the MM II destruction. 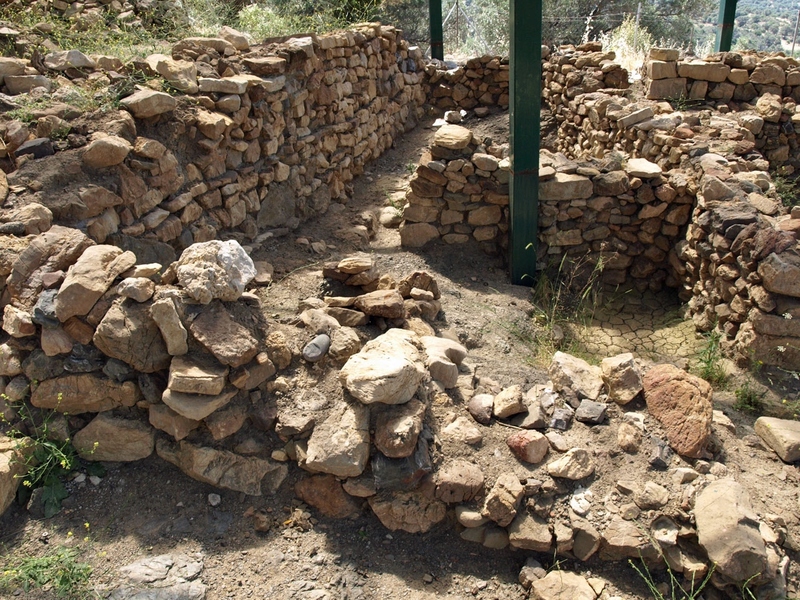 Apodoulou was first excavated by Spiros Marinatos, starting in 1934. 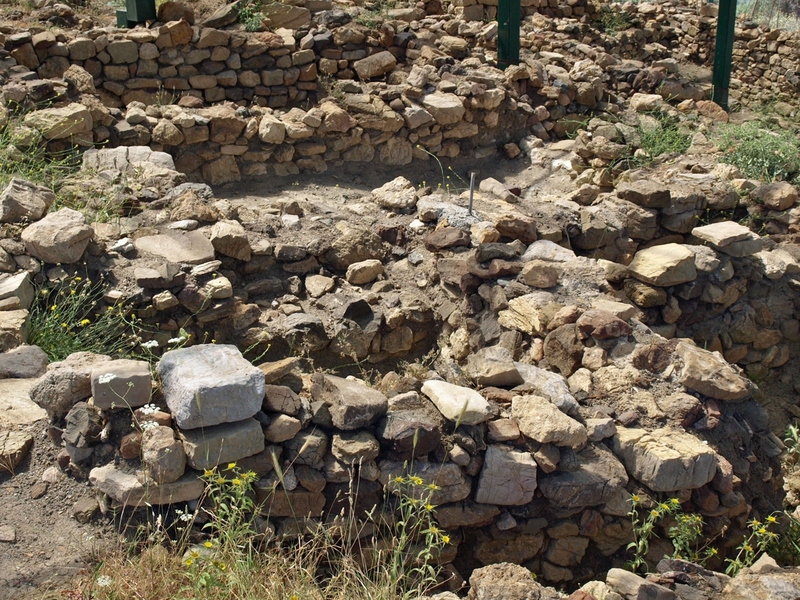 Marinatos uncovered a MM III neopalatial villa dating from 1600 BCE. Finds included numerous vases -- one bearing a Linear A inscription, libation vessels and a small gold double axe. 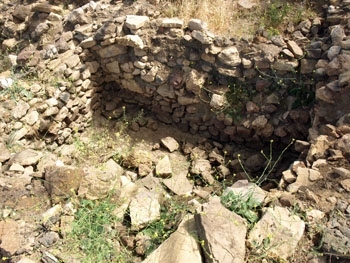 During the Second World War the Germans carried out illegal excavations here, as they did at nearby Monastiraki, and between 1985 and 2005 Italians based at the University of Naples, led by Professor Louis Godart, continued to excavate the site, working together with the Greek archaeological service. 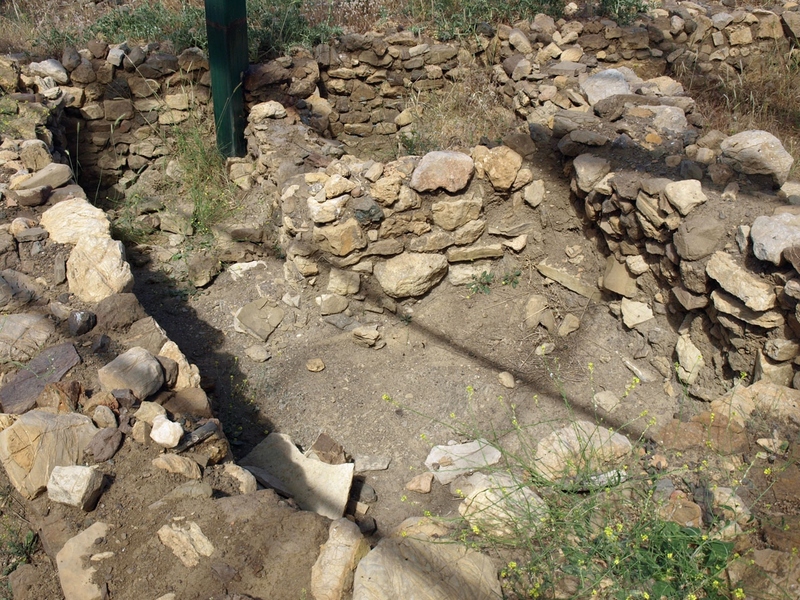 Working to the southwest of the neopalatial villa, the team led by Godart uncovered a number of buildings from the Protopalatial period which were destroyed by earthquake and fire, possibly caused by upturned oil lamps, at the end of the protopalatial period. 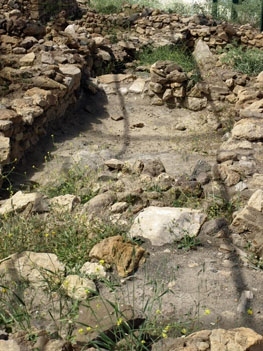 The topography of the settlement was largely determined by the lie of the land since the slopes of the hill forced the builders to construct the settlement on terraces as at many other Minoan sites. Consequently a number of rooms have a set of steps to a slightly higher level at the far end of the room. The settlement was surrounded by a perimeter wall but so far only one short length to the northeast and the southern portion, which is flanked by a paved road, have been found. 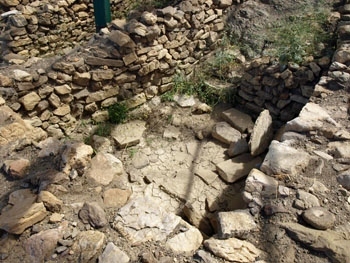 Altogether, six buildings, named blocks A, B, C, D, F and G, covering an area of over 600 square metres have been completely or partly excavated. These can be interpreted as residential buildings with an average area of 100 square metres, composed, for the most part, of small rooms: door-less spaces (accessible only from above), warehouses, workshops, kitchens, spaces containing flights of stairs and residential rooms. It seems likely that some of the buildings had an upper level at least as far as blocks A and D are concerned. The most important building is block A, which has an area twice the average (220 square metres). The rooms are larger than in the other buildings and they were built using more sophisticated techniques. The house seems to have had a large courtyard. The building, which is described in more detail below, was more than just a house. Most of its rooms in fact functioned as warehouses. The buildings are separated by narrow alleys apart from Buildings A and D which adjoin each other and there is a common northwest facade onto a paved road. The only entrance into the settlement so far discovered passed through the perimeter wall. Here a large stone slab, which had been used as the threshold for the entrance to the settlement, was found. From there the entrance passage continued through the northwest facade between blocks delta and zeta. The complex almost certainly carried out administrative and religious functions. Among the numerous rooms, some of which still stand to a height of almost two metres, were storage areas and craftsmen's workshops. 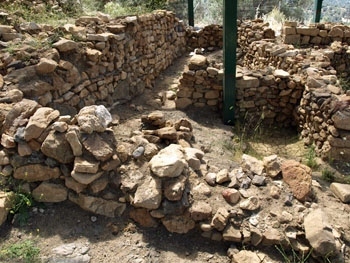 The storage area was located in Building A on the east side of the hill. Areas in block A which have been identified include inner communicating rooms, rooms accessible only from above, two staircases and two entrances from outside, located along the northern side. 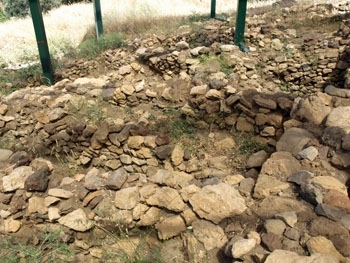 It seems, however, that the appearance of the structure which can be seen today relates to a final stage of its use, as a result of a series of alterations of which the relative chronology is not always clear. It seems that an earlier phase of the complex allowed for greater internal circulation with each room communicating with adjacent ones. Internal steps were built that allowed movement between the rooms situated on the different levels (for example communication between rooms 6 and 12, 4 and 3, and 11 and 12 to 26 -- see plan). Not only were the interior rooms accessible to each other, but they were also connected to both the southern and northern entrances, closed at the time of construction of the perimeter wall. In most of the rooms doorways were excavated although there are exceptions: in fact, rooms 6, 7, 8, 21 and 32 are considered to have been door-less spaces accessible only from above, presumably with the use of ladders or wooden pegs, which obviously have not been preserved. The actions of closing the doorways at a later stage affected most obviously communication between rooms 6 and 4, 8 and 10. The reason why block A was restructured is not known but one explanation is a possible change of use of the rooms in the block. The existence of an upper floor in block A seems confirmed by the presence of the area for a staircase located in room 9, and by one of the two entrances north of the complex. So it had two separate entrances, one for the ground floor and one on the upper floor, close to each other along the same facade. A double compartment to accommodate flights of stairs was also identified in the portion East of the structure, and was probably a second staircase for block A. Hundreds of pithoi and other, smaller vases were found in the building. Louis Godart states that the inhabitants were dependent on their olive crop. The huge number of vases found in the storage area were capable of storing thousands of litres of olive oil. According to Godart this production was far in excess of the needs of the local people and much of the production would have been destined for other parts of Crete, possibly the Palaces. 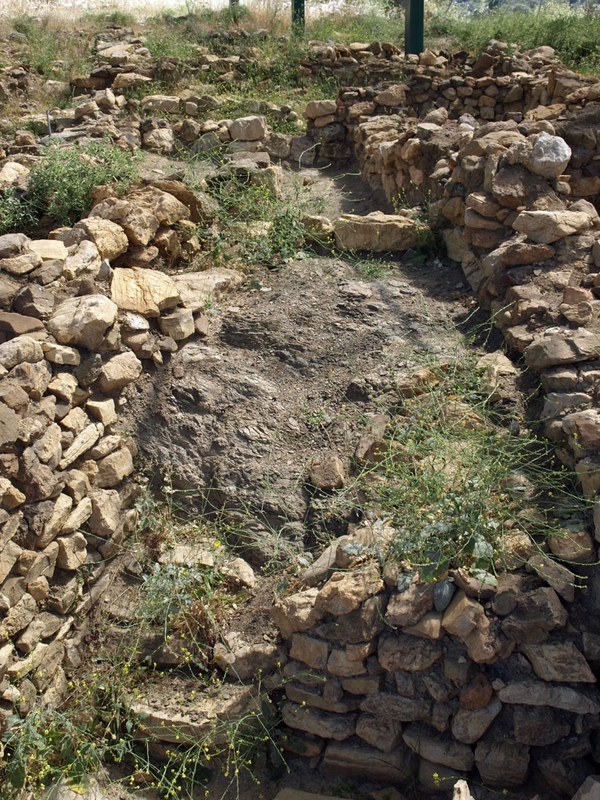 (Elsewhere on the site, Godart's team not only uncovered seals used most likely in the "accounts department" to keep track of the movement of produce but also found sealings identical to other sealings located at Phaistos, thus demonstrating the close administrative and commercial links that existed between the palaces and the local administrative centres during this period). In block A, the largest space, area 3, was a storage area measuring 28 square metres. In the destruction level there was a large quantity of carbonised wood and evidence of an intense fire. Parts of the floor had been paved while other parts used the bedrock for the floor. One structure may have been put in place as the base of a central wooden support. Such a large area would have been difficult to cover even with the use of wooden columns as supports. 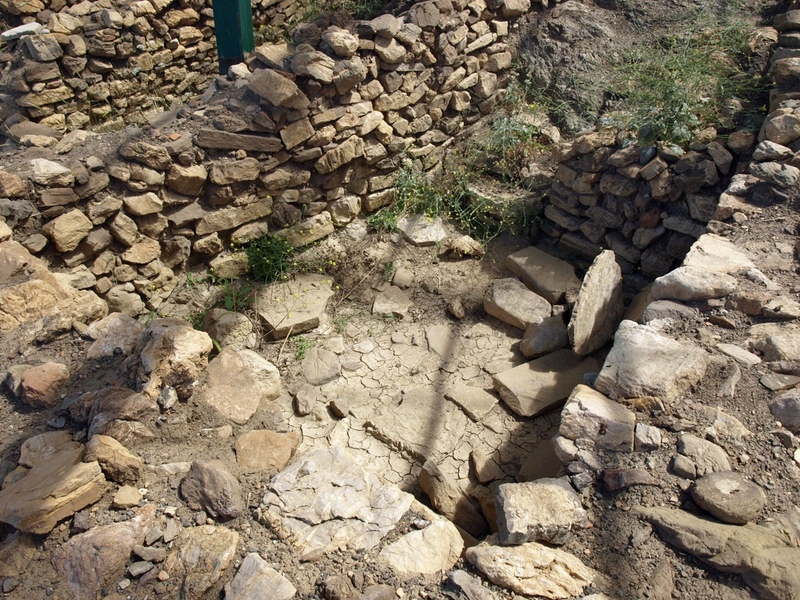 The Italian excavators believe that the space was in fact not covered but was used as a light well to provide light and air to the internal rooms on both the ground floor and the upper floor. 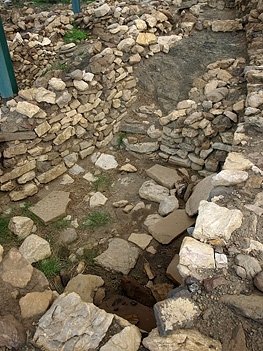 Inside this area, sixteen pithoi were found, some of which were resting on a low wall which ran the whole length of the southeast wall of the area. Other finds included a large number of vessels, polishers, pestles, and sections with a red coating (also found in rooms 2 and 4). It has been suggested that the room leading to the first floor located along the northern facade (room 9) had a double function, both as a compartment for housing a flight of stairs and as a utility room for ceramics. In its western portion 116 vessels were found that had been originally placed on wooden shelves. Traces of foodstuffs were found in some of these vessels, including olive oil, meat from goats, sheep and pigs and chemicals known from ancient Egypt to be used in the brewing of beer. Room 8 would have been a workshop though the nature of the work carried out is not completely clear. 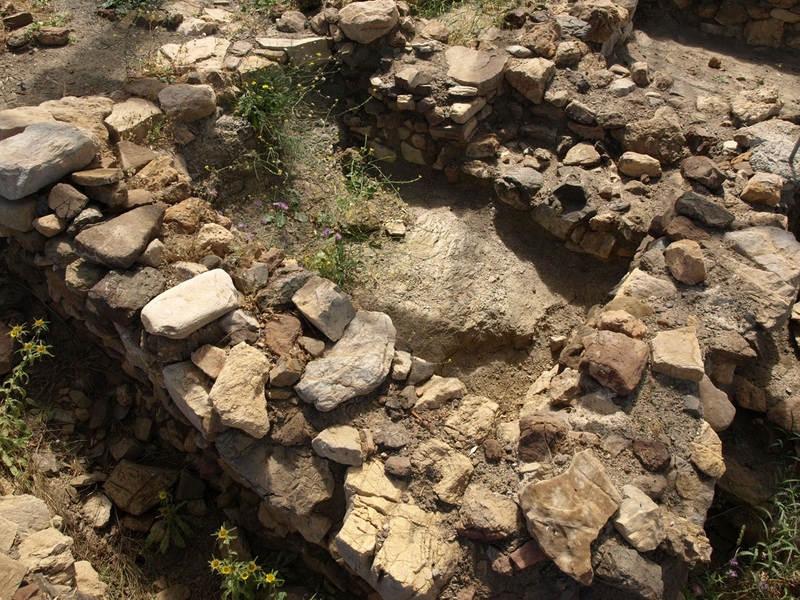 Numerous stone tools and mortars were found here as well as animal horns. Room 4, on two levels, functioned as a storeroom on the lower and as a pottery studio on the upper level, as demonstrated by two hard clay discs belonging to a potter's wheel which were found there. This room has also provided evidence of the existence of a storage room located on the upper floor. The presence of stone slabs (parts of the upper floor), fragments of rhyta and a small stone seal led the excavators to assume there had been a small domestic shrine or living room, on the first floor. Some rooms were used as warehouses for the storage of food. Rooms 2 and 4 yielded dozens of large pithoi and a large number of vessels of all kinds. 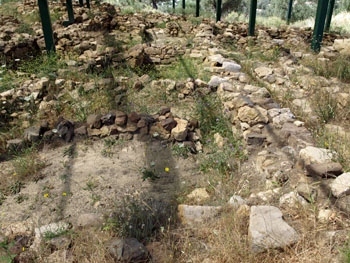 These are the vessels which, as mentioned above, were considered to contain reserves of olive oil ready for distribution to other parts of the island. Room 2 was probably intended to act solely as a warehouse for the storage of small vessels. The function of room 4 is not clear. According to A. Tzigounaki, as well as being used to store vessels, it must also have been a work area connected in some way with a fireplace. The most interesting evidence is offered by a structure built around an artificial cavity in the rock. Stones had been placed in a semicircle, and under this ran a small channel. 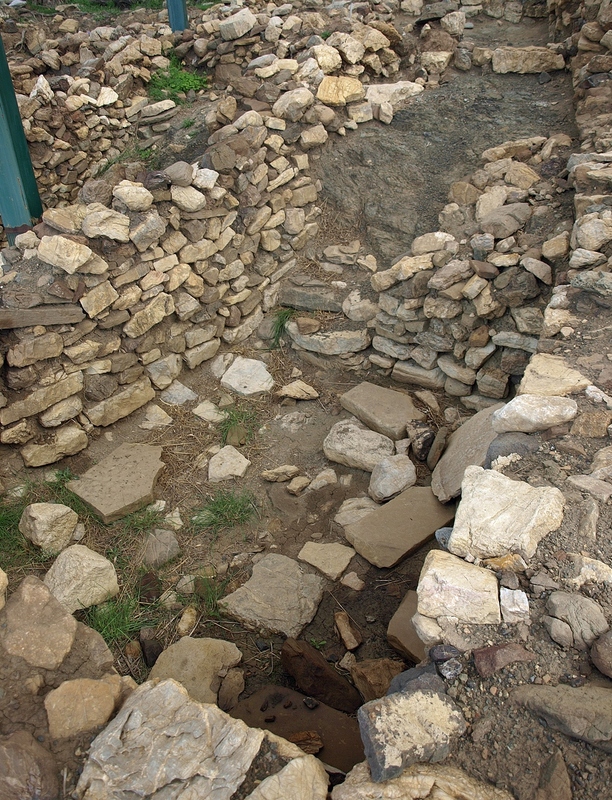 Where this passes under the semi-circle of stones, a bronze pin was found, which the excavators believe may have been used to unblock the closed channels. 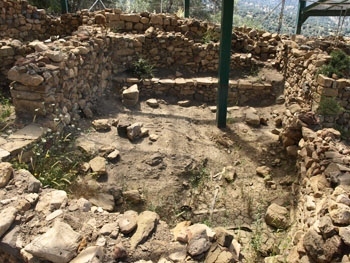 In addition, a hearth with a tripod pot on it was located. 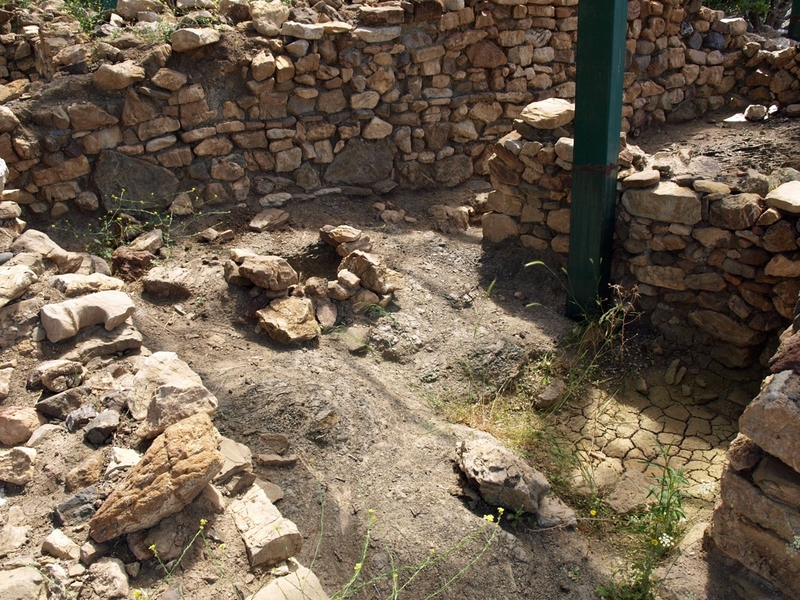 Room 11, which connects to room 12, also contained various vessels. Room 12 was built on the two levels, due to the slope of the rock, and the two levels were connected by six steps. The discovery of large pieces of carbon suggested to the excavators the presence here of a wooden platform. Room 32 yielded mortars and a loom weight. So Block A would have been, at least in part, a terraced building on two levels with a hypothetical courtyard intended as a light well to illuminate not only the adjacent areas, but also those located on the upper floor. Block A would have functioned as a residential complex in which stores and workshops were combined on the ground floor (or basement) and rooms with an exclusively residential use were located on the first floor in keeping with similar buildings found in other parts of Crete. On the road which passes through Apodoulou village on the way to the south coast a tholos tomb, dating from LM IIIA1 or LM IIIA2 was unearthed. It has quite a long dromos of seven metres and a diameter of over three metres. Four upturned larnakes were discovered. The decoration on the larnakes showed grieving figures with upraised hands. 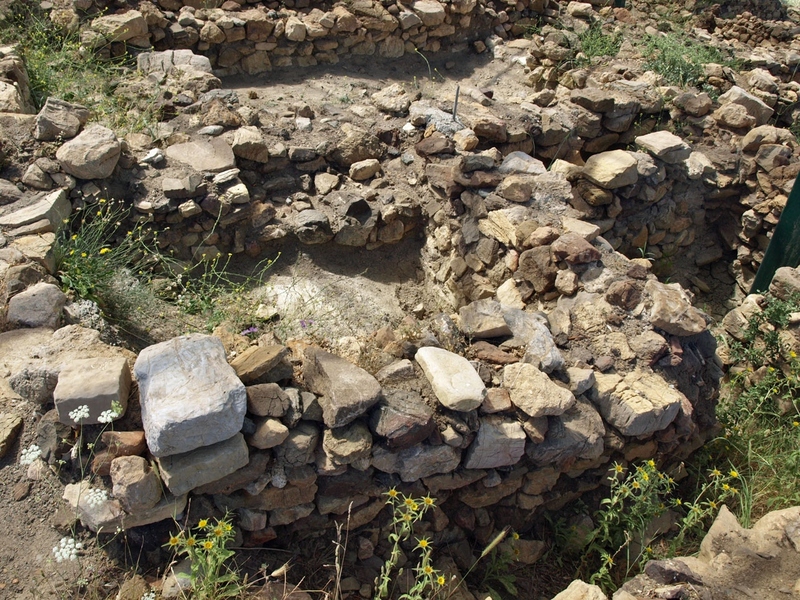 SOURCES: Anastasia Tzigounaki: The protopalatial settlement of Apodoulou, Amari (in Greek); Matilde Civitillo and Biancamaria Greco: Il complesso protopalaziale di Apodoulou Amariou: riflessioni preliminari (in Italian), both available from the Academia.edu website.